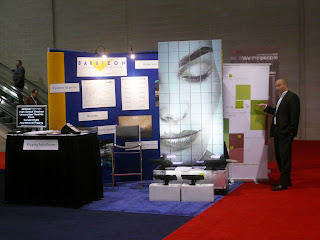 The Barbizon team was on hand at this year's American Institute for Architects conference in Boston. We had an amazing response with a new display product called "Magink". So we wanted to post some more info, pictures and video of the product. The technology behind Magink is the use of proprietary reflective Liquid Crystal Display tiles. Being reflective in nature it requires light (either natural or manually provided) for the image to be seen. Thus it is low energy and lower cost than traditional LED display arrays. It can be used both in and out of doors. 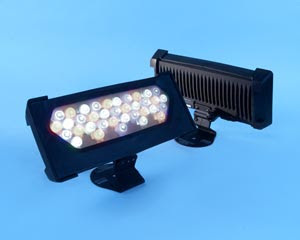 The use of sunlight for illumination makes Magink ideal for outdoor applications, unlike LED, which can sometimes wash out in direct sunlight the Magink system utilizes the sunlight and actually becomes brighter. The installed system costs are less than LED versions and Magink uses about a 1/3 of the energy. Below are three videos and some images of the display at work.. Call your local Barbizon office @ 866-502-2724 (it geo-routes you to the closest location) for more info. But that was not the only items we were showing this year. Because we were not in the main atrium we utilized the Color Kinetics Intelli-White Tr Blast fixture to add some additional illumination. People were amazed at the amount of light output from these fixtures. The IntelliWhite line is available in everything from MR-16's to cove and wash lights..
Last but certainly not least we had Damon Atwood from JR Clancy on hand to talk with attendees about traditional and automated rigging. 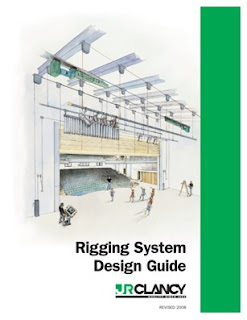 He also had copies of the new JR Clancy Rigging System Design Guide, click on the hot link if you'd like to download a copy.